QuickNet™ Harness (Hydra) and Staggered Harness Cable Assemblies allow for rapid deployment of high-density, multi-port patch field connectivity for Storage Area Network (SAN) applications. QuickNet™ Harness Cable Assemblies optimize SAN patch field organization, ensuring efficient use of horizontal and vertical rack pathways. These assemblies, built with modular MPO connectivity and traditional connectivity provide compatibility, flexibility, and system performance in high-density LAN/SAN switch Equipment Distribution Area (EDA) patch field applications. 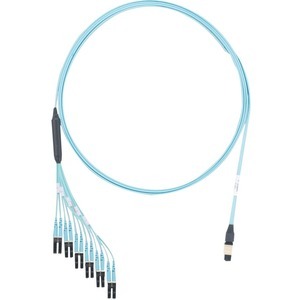 QuickNet™ Harness and Staggered Harness Cable Assemblies are factory terminated and tested to deliver verified optical performance and reliability for improved network integrity. 10Gig versions provide 10 Gb/s network performance up to 300 meters for OM3 and up to 550 meters for OM4 per IEEE 802.3ae 10 GbE standard while maintaining compatibility with legacy systems.